The Lawler Series 4000® Type T Shower Mixing Valve contains a highly sensitive thermostatic element that automatically responds to temperature and pressure variations by precisely proportioning water flow to maintain a constant outlet temperature, providing safe and comfortable showering. 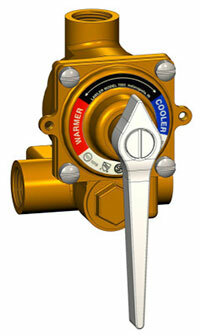 The Series 4000® features a thermostatically operated valve which protects against scalding and chilling. 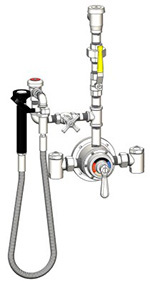 Lawler's Series 4000® exposed valve body is designed with a flat wall mounting flange so the valve can be easily mounted onto a shower wall, spa tub, or cabinet assembly. 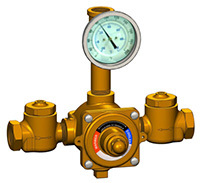 The Series 4000® is available in many styles and combinations to meet field requirements in the temperature control of water, offering maximum convenience and flexibility. 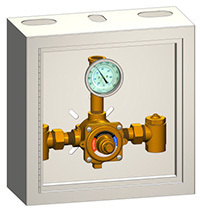 Lawler's Model 410® thermostatic mixing valve (Type T) meets your specification for a small (3/4" NPT) controller for multiple fixtures at point-of-use. 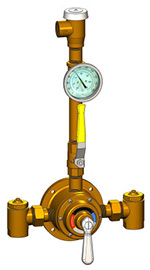 The Model 410® Type T Mixing Valve contains a highly sensitive thermostatic element that automatically responds to temperature and pressure variations in hot and cold water lines. 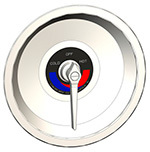 The stainless steel piston and liner precisely proportion water flow to maintain a constant outlet temperature and to guard against unexpected hot or cold water spikes. 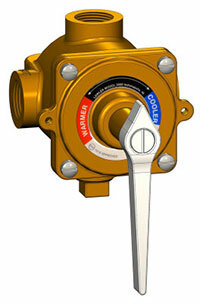 Model 410® precisely controls outlet temperatures to within ±3 degrees with flow rates between 1 to 20 GPM at 45 psi. 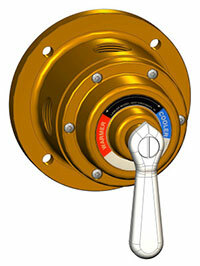 The Model 410® can be installed with or without cabinet. 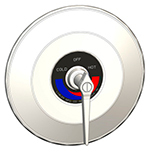 The Lawler Series 7000® Type T/P Shower Mixing Valve combines a thermostatically controlled mixing chamber and a pressure balancing chamber into a compact valve body to provide a full range of safety and protection under a variety of circumstances. The Series 7000® features Dual-Stage mixing technology that compensates for normal changes in water pressure and temperature, preventing fluctuations from affecting preset outlet temperatures. The Lawler Series 7000®, designed to be the safest concealed shower valve on the market, provides maximum safety and protection for critical applications. 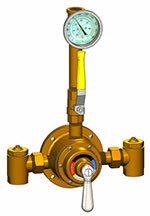 The valve's independent chambers make it a true T/P valve.